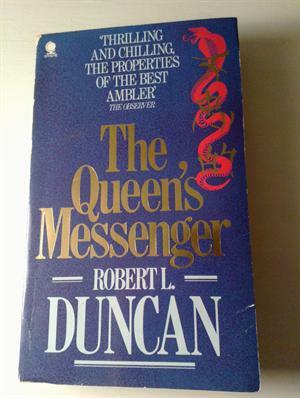 by Robert L. Duncan | Mystery & Thrillers | This book has not been rated. At Hong Kong airport, the unthinkable happens. A Queen's Messenger, a highly trusted diplomatic courier, goes missing - and with him, a key dispatch from a top-secret Western intelligence source, deep in the Communist-infested jungles of Thailand. Only Gordon Clive of M16 can track down the missing man and prevent fatal damage to Britain's South-East Asian network. But the stakes are appallingly high. For CLive's deadly quest for the Queen's messenger will bring him face to face not only with the cold-blooded tortures and assassins of the KGB, but with the raging demons of his own tormented past..."
This book is hanging on the fence by the airport at Eggemoen, by Rotorveien. You've found a free and travelling book. It want to travel around and meet new readers. 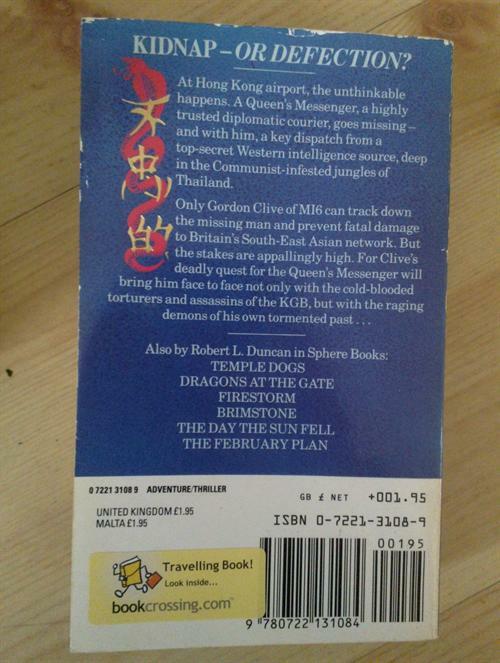 This book is registered here at Bookcrossing.com so that its journey can be tracked. If you have found the book, I would appreciate if you could leave a "journal entry", even if you don't read the book. The journay entry can be made anonymously if you want to. Du har funnet en gratis og reisende bok. Den ønsker å reise rundt og finne nye lesere. Denne boka er registrert her på Bookcrossing.com slik at reisen dens kan følges. Hvis du har funnet boka vil jeg sette pris på om du kunne skrive et "journalinnlegg", selv om du ikke leser boka. Journalinnlegget kan skrives anonymt om du ønsker det. "Why do we read? We read to know we are not alone."